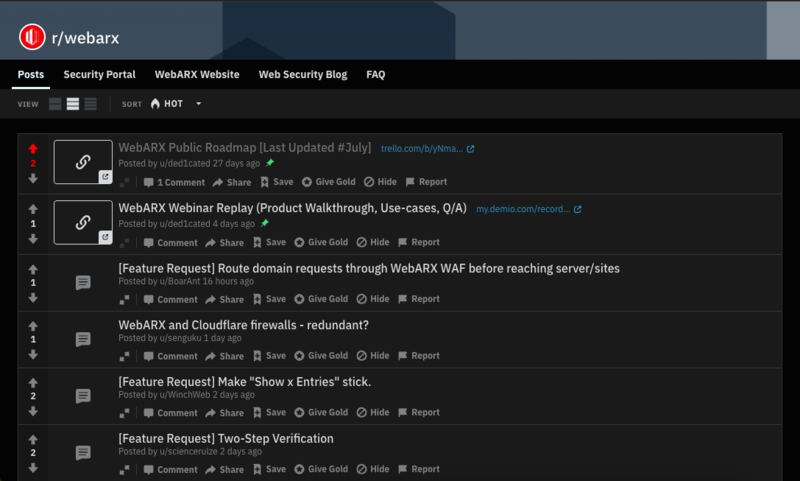 Like many other brands or businesses we also have an online community for our users to talk, ask questions and discuss security and WebARX related matters. With Facebook and Reddit, it’s easier for us to be closer to our customers and get more valuable feedback from those who matter. In its simplest form, a community is a group of people who share a common interest. An online community formed around a particular business consists of customers, both existing and potential, who are interested in the product or service that is offered. Community building is a great way to interact with its user base. Why is an online community so vital for our business? WebARX is a young company and we try to be flexible as we grow and improve our product. As the way to growth, we need to constantly improve our portal and plugin. To be able to improve the service and product so that people will benefit from it we need a community of people who value security, who would use the product and can see what kind of features would they need to make the everyday life easier, safer and more organized. To speak to our users we made a Facebook and Reddit communities to build closer relationships with our users, to share the values, share the knowledge and expertise. Since 97% of adults, aged 16 to 64 have at least one account in some social platform, we believe it’s the best way to deliver new information fast and make it easily reachable for everyone. We love to talk to our customers because they are the ones that we built WebARX for. To engage, listen and act the way our customers would prefer the product to grow is one of the most important parts of our business. So what we value the most is security and relationship between us and our users. WebARX Reddit board is more for technical communication – feature requests and technical discussions. We would expect our users to post feature requests and upvote on the requests which they would like to have. In addition to feature requests, you can post feedback, ask for help or share some findings you think others will also find interesting (included WebARX team). Remember that Reddit won’t be a replacement for support and if you have any questions regarding your account, billing, technical issues, etc you should turn to support@webarxsecurity.com before asking for help from there. Join the Reddit community here. WebARX Facebook community is meant for more general discussions and information sharing. It’s a place for discussions about different related topics and to meet others who also value security and want to help us make to world more secure one website at a time. Keep in mind that WebARX Facebook community has not been made to give technical support from the WebARX team. If you need support or any help with WebARX services you should contact us directly at support@webarxsecurity.com. We believe that an online community will bring us a rich source of invaluable information we could use to make our product better. Through the community, we want to ask questions and answer questions, create polls to see which ideas are worth implementing and share updates on our services, blog posts and everything else we believe might interest you. We want our users to join the community because without the people there would be no community, right. So if you are a WebARX user or are planning to become one someday, don’t hesitate to join the group. We will gladly welcome you all aboard!